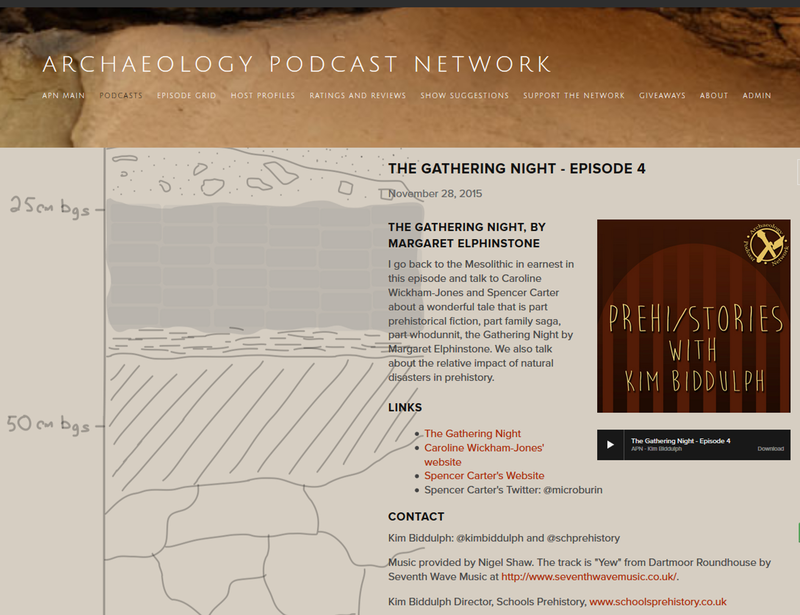 Kim Biddulph, Director of Schools Prehistory, has launched a series of podcasts where she invites archaeologists and experts in teaching prehistory to review books about Britain BC. Without intending any hubris here, I had the immense pleasure of reviewing the fantastic novel The Gathering Night by Margaret Elphinstone – with Caroline Wickham-Jones and Kim. Our 2.5 hour recorded session has been deftly edited to 1hr:20mins where we talk to the archaeological and environmental record around which the author has woven a beautiful story. That story is replete with people, with names, in a tangible and changing environment, a landscape with names, seasons with names, and a mega disaster which is very real. We know it happened. It was terrifying. There are genders, generations, a crime story, gossip around fires and shamanistic – rites of passage – events. There is also social justice and a perception of – a relationship with – the natural environment that only echoes in a tiny but persistent way in our present, modern supermarket lives. Those engaged with this week’s COP21 Climate Change summit in Paris might find some sustenance in what we already know. It’s archaeology. But do we ever learn? B Finlayson (2005) Wild Harvesters: The First People in Scotland. The Making of Scotland (Historic Scotland Series). Edinburgh: Birlinn. V Gaffney, S Fitch and D Smith (2009) Europe’s Lost World: The rediscovery of Doggerland. York: Council for British Archaeology. J Leary (2015) The Remembered Land: Surviving Sea-level Rise after the Last Ice Age. London: Bloomsbury. C Waddington (2014) Rescued from the Sea: An Archaeologist’s Tale. Newcastle-upon Tyne: Archaeological Research Services and Northumberland Wildlife Trust. G Warren (2010) Mesolithic Lives in Scotland. Stroud: The History Press. C Wickham-Jones (2010) Fear of Farming. Oxford: Windgather Press. Honorary Research Fellow in the Department of Archaeology, Durham University. This entry was posted in British archaeology, Hunter-gatherer-fisher, Mesolithic by Spencer Carter. Bookmark the permalink.